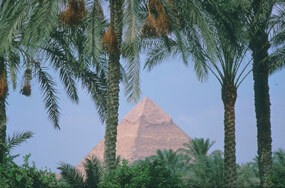 Giza is the name of a district near Cairo where the famous necropolis of the 4th dynasty can be visited. 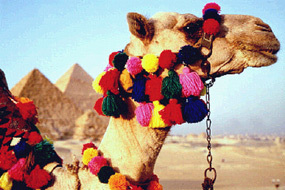 Points of interest are of course, the famous Sphinx and the pyramids of Cheops, Chephren and Mycerinos. 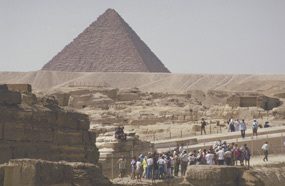 One of the most famous structures in the world built by King Cheops (4th dynasty) about 2,650 BC. At the base it measures 210 x 210 metres. On the north side it possesses two entrances leading down into a passage and then across a corridor to the burial chamber, which still contains the large granite sarcophagus of Chephren. Among the most interesting features are the remains of the Valley Temple with it's granite casing and the rising causeway leading to the pyramid. This temple witnessed the religious rites of embalming Chephren's body. The ancient Egyptians carved spacious ditches in the rock, where they placed wooden boats, to be at the disposal of the king when he went on his journey with the sun god Ra, in the "after world". Early excavations unearthed three empty ditches, on the east side of the Great Pyramid, once dug to contain solar barques. 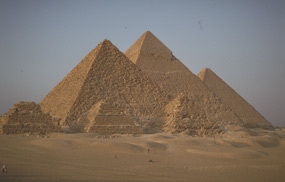 Almost 2.5 million blocks of limestone were used in building this pyramid, which measures 230 x 230 metres at the base. It was originally 146 metres high and is today only 137 metres high. 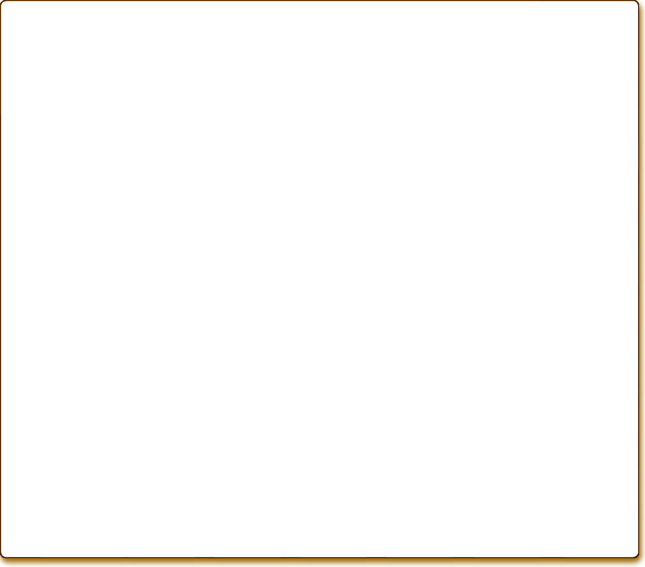 It's sidelines are exactly oriented to the north, south, east and west. 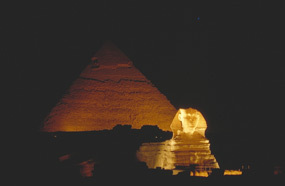 This pyramid was built by Chephren (son of Cheops), south-west of his father's pyramid and is very similar to it. Although lower in height, 136 metres, it looks higher as it was built on a higher plateau. Finally, the smallest of the three pyramids, barely 66 metres high, was originally covered with red granite stones from Aswan. The burial chamber, once contained a splendid sarcophagus of basalt, is now empty. All three pyramids of Giza are surrounded by several small pyramids and hundreds of mastaba tombs belonging to the members of the royal family, nobles and high ranking employees. Two other sites were discovered to the south of King Cheop's Pyramid, from which a large wooden boat in a very good condition has been revealed and is now to be seen in a museum south to pyramid of King Cheops. On the way down to the Valley Temple of King Chefren, the famous large statue of the Sphinx is located. This colossal statue represents a body of a lion with a human head measuring 70 metres in length and 20 metres in height. 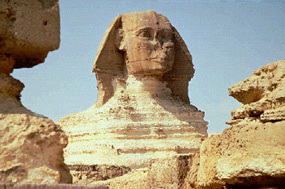 Many scholars and scientists share the opinion, that the face of the Sphinx closely resembles that of King Chefren.